What I need is some simple books that I can read in Chinese, to improve my vocabulary and character recognition. That’s how I became a great English student – I read constantly as a kid. 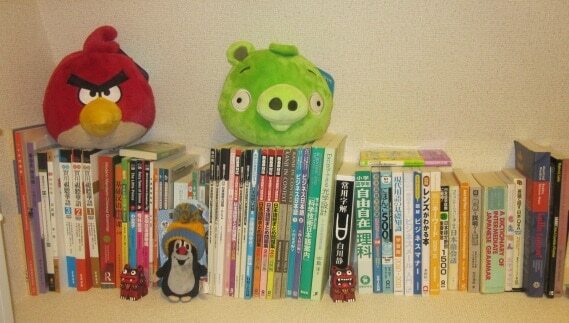 I know traditional characters (and can easily read bopomofo), so books from Taiwan would be good. But I need to learn simplified characters, so books from the mainland would be good too. Any ideas for good Chinese readers? I’m not a huge fan of readers (which is why I made Perapera!) but I’ve heard good things about the John DeFrancis readers. I also have various kids books in traditional and simplified characters, but to be honest I do most of my reading online. Check out the Chinese Breeze readers. Each book is actually its own story. The stories are fun, and they do a really good job of repeating things in a way that seems pretty natural. They’ve finished 2 “levels” of readers so far (300-word and 500-word), and are planning on going up to 8 levels. Thanks for the info. I haven’t seen those books before. Out of curiosity, why do you need to learn Chinese when you live in Japan? Good question! We actually both use Chinese for our full-time jobs as it’s becoming more and more necessary for business here. That aside, being language geeks we were always interested in learning Chinese anyway. Peraperakun is the main reason I keep putting up with Firefox. For other Chinese resources though, there is now almost an embarrassment of riches on the Internet. For anyone interested, here is a collection of language links that I’ve accumulated, including a large section on Chinese: http://thormay.net/LanguageStudy/languages.html . One very interesting recent discovery was Gradint (http://people.pwf.cam.ac.uk/ssb22/gradint/) which helps you to construct your own Pimsleur-type audio courses with spaced repitition. I’d never heard of Gradint before but it sounds interesting. Hi, I wonder if you could recommend me any book for advanced students of the Chinese language. I am struggling with the transition from completely informal Chinese to formal Chinese (both writing and listening) I wonder if you could give me any references. I started getting interested in putonghua in 2003 from the Hanzi located in the margins of a book by Ezra Pound, his ‘Classic Anthology’ of Confucius pub by Faber; pre web here I went to the library and started with pen and paper. Hanzi fascinate me… have done ever since aged five (circa 1963) my uncle John give me some pages from a Chinese / Cantonese newsapaper, stuck in my mind all those years. This last week I have discovered online pop-up cidian and its a revelation, an extremely valuable learning aid. My opinion as to the best book would be the Cambridge ‘Chinese Starter Dictionary’ an incredibly useful and informative book….. my personal favourite. Hi, I’m an IB Mandarin student who is struggling to study for Mandarin in about 1 year. Would the book “Modern Mandarin Chinese Grammar: A Practical Guide” be helpful for studying for this kind of exam? And do you know any other kind of books that would be helpful for me to study for this kind of exam? Hi. I couldn’t see the test you linked to. Yes that book is very good. That said, I think that, in general, it is better to study for the language itself rather than for any particular exam. If you study Chinese with good resources your exam scores should go up. Focus on building vocabulary and getting enough input through reading and listening and you will be OK.
Great resource and really nice job with the plugins, thank you! I am starting to learn Chinese, and I bought as you suggested Modern Mandarin Chinese Grammar. For the textbook, I read Integrated Chinese from Cheng & Tsui publisher to be one of the best courses. Do you know it? Could you provide me an advice whether it would be better to buy this one or the ones you suggested? This one provides a comprehensive set of textbooks, workbooks, audio, and other tools. Hi Ateny. I’m not familar with that series. Do you mean this one? They revised it. I mean http://www.integratedchinese.com, with more details http://www.cheng-tsui.com/store/products/integrated_chinese. Hello. I’m hoping to tap into the depth of knowledge I see here. I operate a small language school in Japan and am trying to source some Chinese language teaching materials. I wonder if you are able to help me. I’m searching for text books that teach Chinese technical / engineering vocabulary. Or even bilingual dictionaries would suffice. Can you possibly recommend anything to me? Or suggest where I could find text books like that? I’m the Marketing Manager for Tuttle Publishing Language. I saw your review for Tuttle’s “Learning Chinese Characters” and was wondering if you might consider one of our newer books, “Chinese for Beginners” for your list. It is now the #1 Chinese self-study book in the US. If you would like to receive a copy for review, I can arrange to have one sent. You can get a hold of me at mpage@tuttlepublishing.com. I’m actually trying to find some Mandarin Chinese children’s books with Traditional Characters (with or without CD) for my two sons. Any help and information would be great! Thank you! Actually i want to learn chinese language and i want to speak chinese.for me which book is better.basically i go guanzhou every after two month for my business purpose.can you help me to find best learning book for me. Hey, this is fantastic work! The plugin for chrome is very useful. I was just wondering why Assimil does not make th cut? I’m a beginner and am weighing up buying practical audio visual Chinese or Assimil (first! ), and would lve to know you preference. Hi, I’m very old man and I have no time to devote learning languages thoroughly. But I want to read Buddhist texts written in Chinese. I think, they are written in traditional Chinese. Therefore, please tell me, how I can learn traditional Chinese only to read these Buddhist texts. Any good book, please.